Inaugurating the Bangladesh Bhavan at Visva Bharati University campus, together with Prime Minister Modi, Hasina expressed gratitude to India for "standing beside Bangladesh in times of crisis." 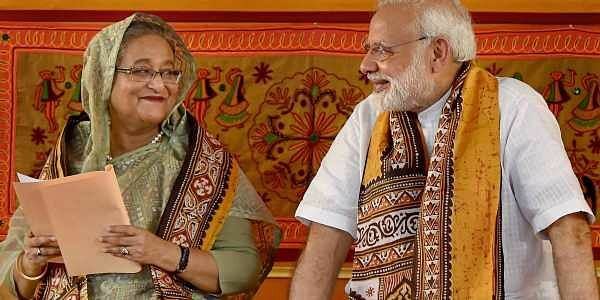 SANTINIKETAN: Bangladesh Prime Minister Sheikh Hasina today hailed India for standing beside her country in times of crisis and said negotiations in an amicable way have led to the resolution of many bilateral issues. In the past, the two countries had settled border disputes with the signing of Land Boundary Agreement for exchange of enclaves, she said. "Together we have resolved many bilateral issues in an amicable way for the benefit of both the countries. Although there are issues that still need to be taken care of, I do not wish to mention them at this programme," Hasina said. Inaugurating the Bangladesh Bhavan - a centre dedicated to cultural cooperation - at Visva Bharati University campus, together with Prime Minister Narendra Modi, Hasina expressed gratitude to India for "standing beside Bangladesh in times of crisis". "We shall never forget how India stood beside us during 1971 liberation war," she said. Bangladesh was working hard to alleviate poverty in the region, which poses a major problem for a developing country, Hasina said. "We are getting all cooperation from India, as both the countries want to alleviate poverty in this region. By 2041 we want to develop Bangladesh into a 'Sonar Bangla' (Golden Bangladesh)," she asserted. Talking about Bangladesh Bhavan, set up by her government, Hasina said, "We are delighted with our share in Visva Bharati University. The students, scholars and teachers will be immensely benefitted from this Bhavan." Remembering Rabindra Nath Tagore, Hasina said the bard had built the university to give shape to his ideals. "Tagore belongs to both India and Bangladesh because he has written the national anthems of both the nations. He wrote most of his poems in Bangladesh and that is why we can claim a greater right over him," she added.